WALKING THROUGH rural Ukraine in 1932, having eluded his Communist Party chaperone, Gareth Jones witnessed disturbing deprivation. People were starving, fighting each other tooth and nail for a single loaf of bread. Bodies lay in the street until they were piled up and carted away on wagons. While its own citizens suffered, the Soviet Union was continuing to export grain, projecting an image of prosperity to the West. Recent estimates have suggested that around 4m people perished in 1932 and 1933, around 13% of the Ukrainian population, in what is known today as the Holodomor (“killing by hunger”). At the time, though, few believed Jones’s reports; many politicians, diplomats and journalists tried to discredit him. In “Mr. 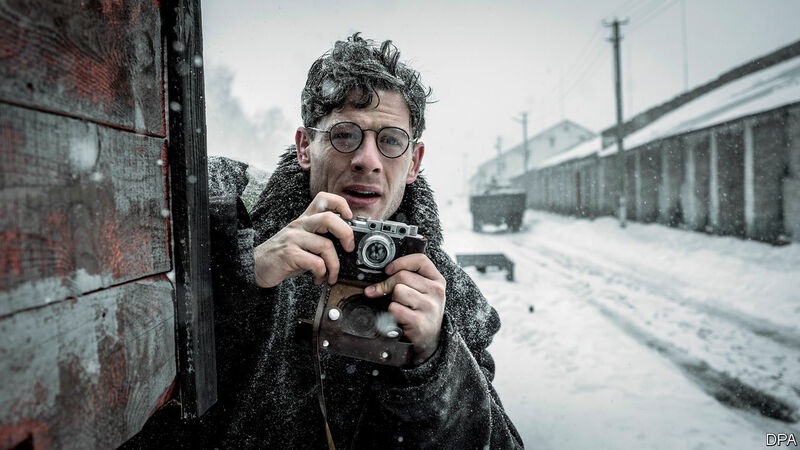 Jones”, a feature film which premiered at the Berlinale, the journalist’s search for the truth makes for stylish and compelling historical drama. It opens with Jones (played with sincerity and conviction by James Norton) presciently explaining the danger of Germany’s National Socialist party to Lloyd George, his boss at the Foreign Office, and his colleagues. They scoff at this bold young man. Before he can argue that the economic forecasts released by the Soviet Union are also a cause for concern, he is made redundant as a result of budget cuts. Jones decides to investigate the matter himself, and, despite not having an editor to recommend him, talks his way into getting a press visa for the USSR. He refuses to accept the same political restrictions as the other journalists he meets in Moscow: their reports, conforming to the Pravda version of the truth, claim that the economy is thriving and that collectivisation has been a boon to farmers. What he discovers, despite the efforts of Soviet officials to limit his information-gathering trips, is quite the opposite. “Mr. Jones” depicts the desperation, violence and cannibalism that Ukrainians were driven to, yet avoids sensationalism or gratuitous horrors. The film’s villain is not some Soviet heavy, but Walter Duranty (Peter Sarsgaard), the Pulitzer prize-winning Moscow bureau chief of the New York Times. He, along with other members of the Western press, conspires to keep this tragedy under wraps, and is often more interested in the chemical and sexual highs that 1930s expat life in Moscow could offer. The real-life Duranty published an article entitled “Russians Hungry, But Not Starving” which made light of Jones’s reporting. (He wrote that “it appeared that [Jones] had made a 40-mile walk through villages in the neighbourhood of Kharkov and had found the conditions sad”; the New York Times has since repudiated his coverage.) In the film, he views staying silent on the horrors of authoritarianism as an expedient part of the business of reporting from Russia. Ada Brooks (Vanessa Kirby), the Times’s star reporter, is less convinced, but both defend the USSR’s actions, insisting that the long-term project may demand some short-term distress. The truth, in their view, can be shaped. Jones, as the film’s moral lead, explains the shortcomings of this attitude in scenes and dialogue that can be rather self-conscious. He is convinced that finding out and publicising incontrovertible facts will lead to action, and do the world good. Unlike the staff journalists, whose livelihood lies in Moscow and who must therefore keep the authorities happy, in the film Jones’s role as a freelance reporter offers him a kind of independence that allows him to devote himself to the pursuit of the truth. Although he does not manage to persuade Duranty, Jones does convince another high-profile writer of the ills of the USSR: Eric Blair, better known as George Orwell. Scenes of Orwell in front of his typewriter at work on “Animal Farm” are interspersed anachronistically—the novel was written 10 years later—throughout the film. These interludes show Blair becoming noticeably more critical of authoritarian power after the two writers meet and discuss what Jones saw in Ukraine. It is a clunky narrative device, suggesting that the film-makers did not have faith in viewers to understand the evils of totalitarian censorship without an Orwellian name-drop. A few years after the events depicted in the film, just before his 30th birthday, Jones was murdered in Mongolia by mercenaries connected to the KGB. “Mr. Jones” holds its subject up as a model for reporters everywhere, even if at times it turns him and other characters into ciphers. Any hesitation, fear or even cowardice Jones might have shown is absent from this account. Still, at a time when journalism is the subject of scorn and calumnies, the film points out that the profession can demand righteousness, bravery and even heroism.